An investment in a geothermal system offers you more than a way to heat your home in the winter and cool it in the summer. Whether you are committed to improving the environment or you dread the hassles of home maintenance and upkeep, or maybe you just want to save on your monthly utility bills (and who doesn’t! ), a geothermal system is your total solution. Whether you’re dreaming of new construction or retrofitting your existing home or business, our geothermal system is the smart way to heat and cool your living or work space. You won’t need to worry about the rising costs of heating fuel and natural gas, because the energy you need is on your property, in the ground, right beneath your feet. The Environmental Protection Agency has called the geothermal heat pump the most energy-efficient, environmentally clean and cost effective space conditioning system available. 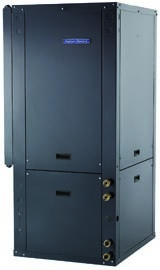 The systems we use are some of the best geothermal heat pumps available today. And, our systems utilized ColdClimate Technology – a major asset in all cooler climates. Contact Richter Heating & Cooling today to learn more about geothermal systems. Call 715-557-0583 or complete our online Request FREE Estimate form.